West Kent Towers had a day out today, to Eastbourne. Actually, it wasn't quite Eastbourne - we didn't see the sea. It was to a town called Willingdon. Our rendezvous was a dusty car park of a pub called The British Queen where we were to meet the doyen of South Downs, Tom Liddiard. Mr Liddiard was waiting for us upon arrival and let out a shriek of welcome which sounded like Dame Edna doing an impersonation of Christopher Biggins. Which strangely is not dissimilar to how he looks. Jon Botten and Matt Boughton looked understandably nervous. We were there to organise the finer details of the West Kent charabanc, which will be descending on these parts next Saturday for a 40:40 campaign day. Shall we go for a cup of tea, suggested Dame Edna, pointing towards the village cafe. As we walked towards it I noticed people staring at me with a look of suspicion. Not just the odd glance - but full on gawping, which didn't abate when eyes met. Even Jon Botten noticed the staring. At the cafe the entire clientele stopped chatting and turned to stare. I expected Edward and Tubbs to appear and shout this is a local shop... "Why are they all staring at me, Tom", I asked - feeling slightly more anxious and insecure than I ought to. 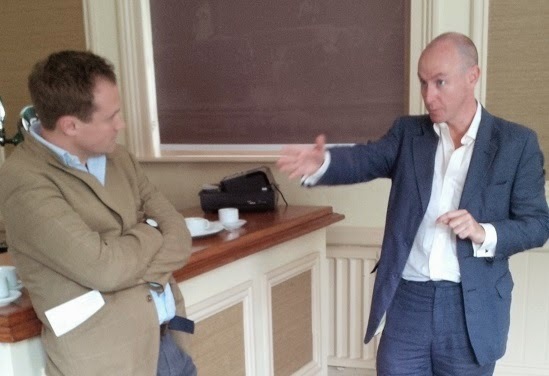 "I suspect it's your turquoise trousers - they probably think you're a property developer from London." I thought this was quite a precise observation, but it did explain the air of hostility. I am pleased to say the cafe was full, which was quite a relief as I suspect my turquoise trews would have put them off their Battenberg, so we made out way back the The British Queen. Directly through the door there appeared to be a pile of recently washed undergarments piled-up on the billiard table - which struck me as odd, particularly for East Sussex. As we entered silence fell as the regulars put down their drinks and stared. We made our way to a quite corner to chat, only to be told, "you'll need to be quick, this corner's reserved for a wake." We hurriedly went through the plans as a black clad waitress made her way in and out with tea cups and plates of ham sandwiches. "You'll need to leave this section now, the grieving are about to arrive." I asked to see Saturday's drop off point, which was a 10 minute walk. As we made our way we were shown the public lavatories, which people could use "if they were still functioning." I wasn't sure if Tom was referring to our members or the loos. Apparently the block had been purchased by the Parish Council for a new office. "And what about hospitality?" I enquired, thinking the team might welcome a cup of tea after a two hour journey. Tom, however, had that covered. One of his local members ran a vending machine company, and he had arranged for him to bring an urn of boiling water to the car park. What they would plug it in to I didn't ask - but I suspect it will be all right on the night. If all else fails at least we can all have a nice hot wash before we leave. We bade our farewells and headed back to the car. "And if any of your members would like to stay all day, we have a fund-raiser in the evening they might enjoy. It's BUNS, BANGERS and BINGO." Tom and his team are doing a great job in Eastbourne - and we're all looking forward helping out. There's still space on the coach if you can join us! See HERE for details. The re-selections have commenced ! 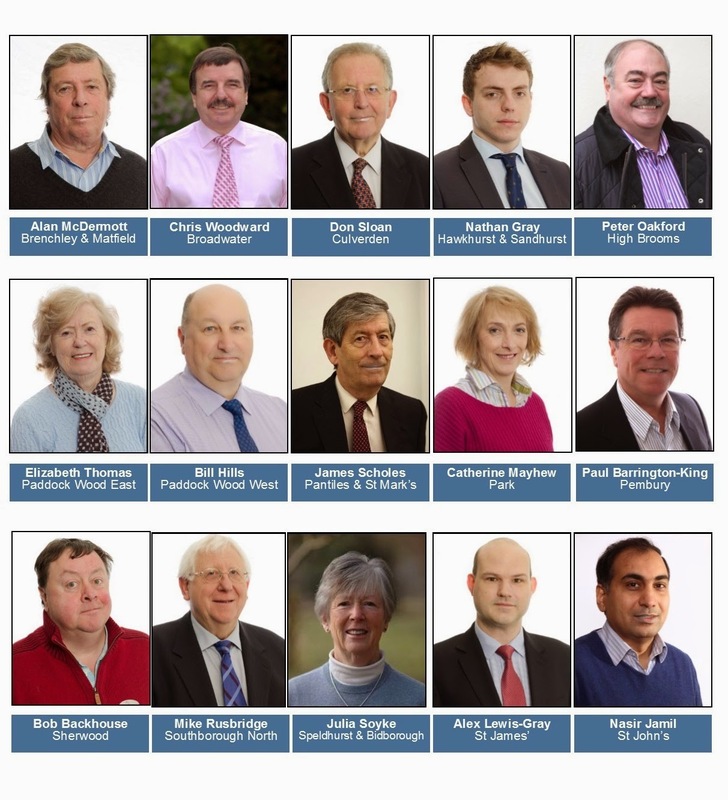 One of the issues I hear most often (from Kent and beyond) is the lack of support some councillors give their Associations, often vanishing into the ether, except when they are up for re-election when they are first in line asking for help and support from others. I am pleased to say that in most of West Kent this isn't an issue. And the reason it isn't an issue is the Associations make it absolutely clear what is expected of councillors when they first become candidates. I am aware of one Association whose Officers and activists are highly critical about the lack of input and campaign support from councillors, but at each election they automatically re-select the poor performers without any discussion or sanction regarding their lack of support for the Association's wider political goals. I am afraid to say that they only have themselves to blame! The original three West Kent Associations follow the CCHQ Mandatory Selection Procedures to the dot, including re-interviewing incumbents and assessing their performance against pre-defined KPIs. The tools for achieving this are all in the Mandatory Selection Rules; don't blame the councillors (or the Party) if your Association chooses not to use them! For example, on the "Agreement to Stand" (an integral part of the CCHQ Application Form which all candidates must sign) includes the following two clear objectives. "Councillors must play a full, active and constructive part in their local Association during the whole of their period of office, including campaigning, membership development, fundraising and political activities”. “They must cooperate fully with the campaign strategy for elections including giving mutual aid to other Conservative candidates when asked and, when themselves a candidate, complying with the requirements of the duly appointed Election Agent." It should really come as no surprise therefore when, as part of the re-approval process each applicants campaign and mutual aid record is taken into consideration. 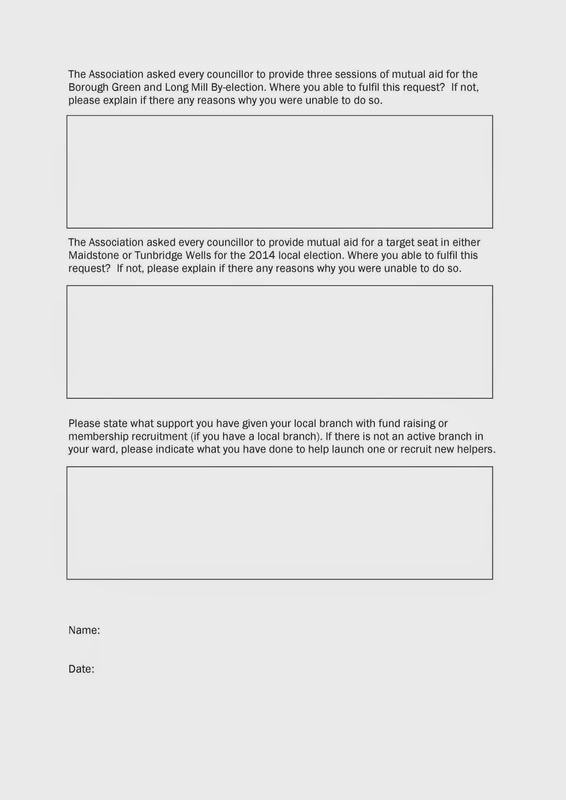 In fact, in addition to the standard CCHQ re-application form, Tonbridge & Malling are also asking candidates to complete the following form, reviewing how they responded to various (not unreasonable) mutual aid requests over their four year term. 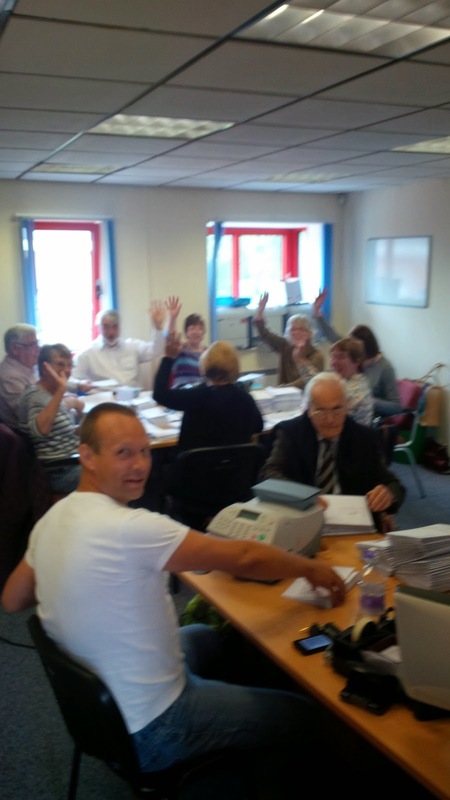 Tonbridge & Malling are commencing their selection procedure for the all-out elections in 2015. With many more applicants than vacancies, it will be an interesting process. 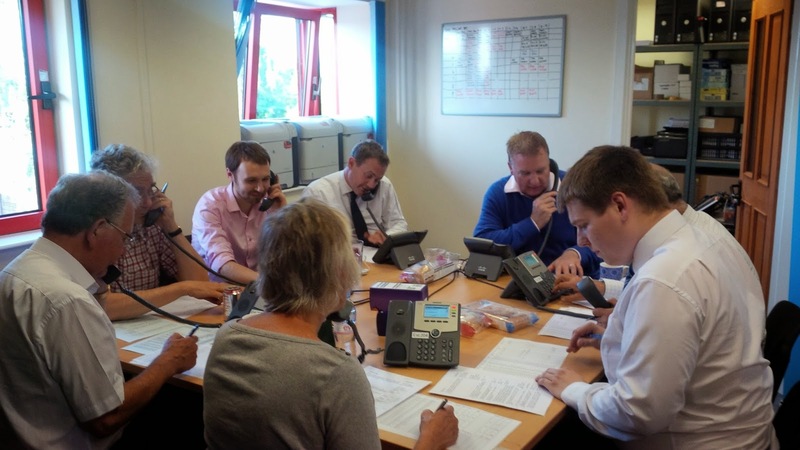 Great team in yesterday who between them managed to pack and post five constituencies-worth of summer raffle tickets. Sadly, in these times of austerity, the sticky buns have been replaced with ginger snap biscuits. Ann Barnes boasts about large increase in Twitter followers! Yes, Ann. For all the wrong reasons! 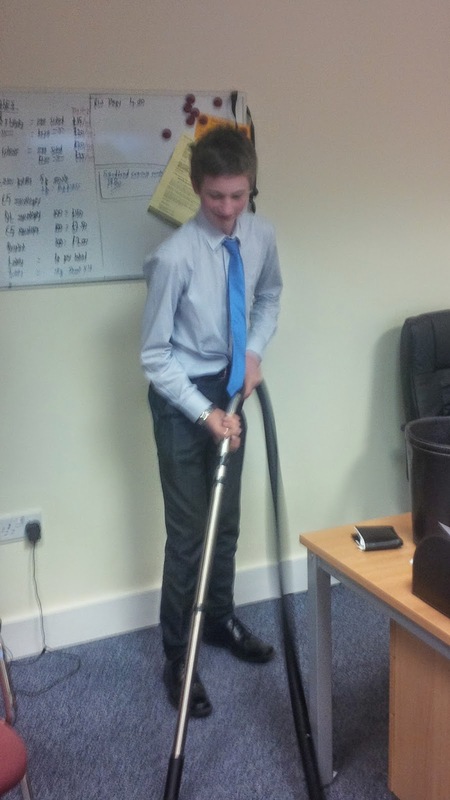 Much hilarity at West Kent Towers yesterday when one of out team of packers described one of our MPs as a DILF. "Do you know what that means..." I asked, a bit wide-eyed with surprise. Oh yes! She said, announcing the words but giggling girlishly on the F.
Don't worry - I shall spare everyone's blushes! Oh joy. Deep, deep joy! Let's be clear on this. 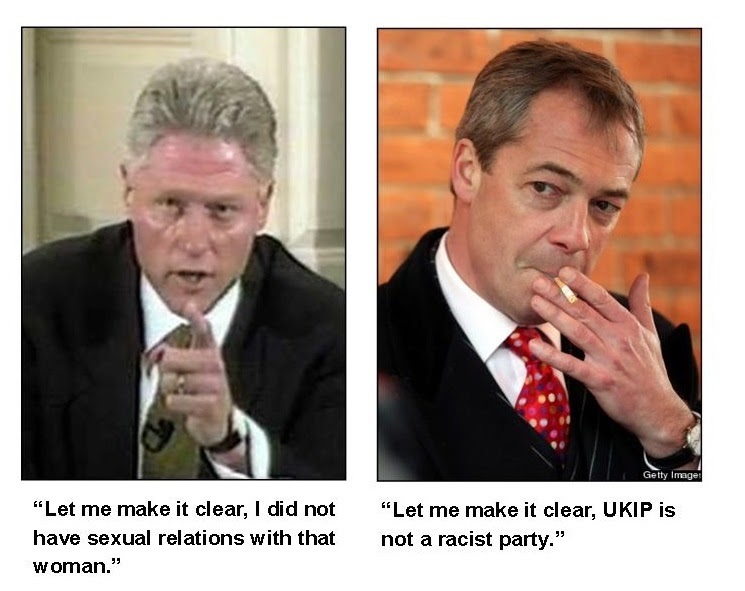 The UKIP "Group" conists of TWO people. One of whom was elected three years ago and the other two years ago. It's more of a cult than a group. 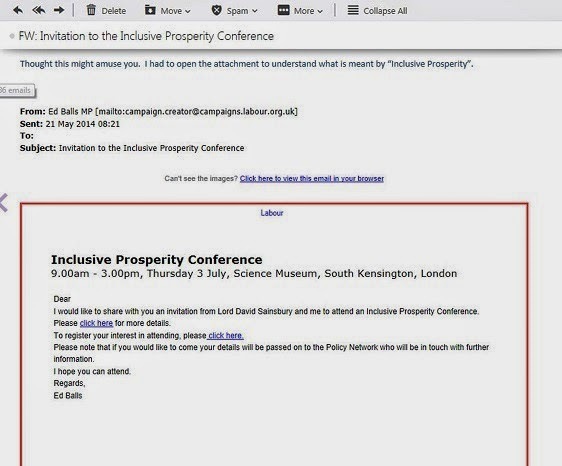 I suspect "meeting cancelled" means they have fallen out with each other (again). Or perhaps the small broom cupboard was already in use? 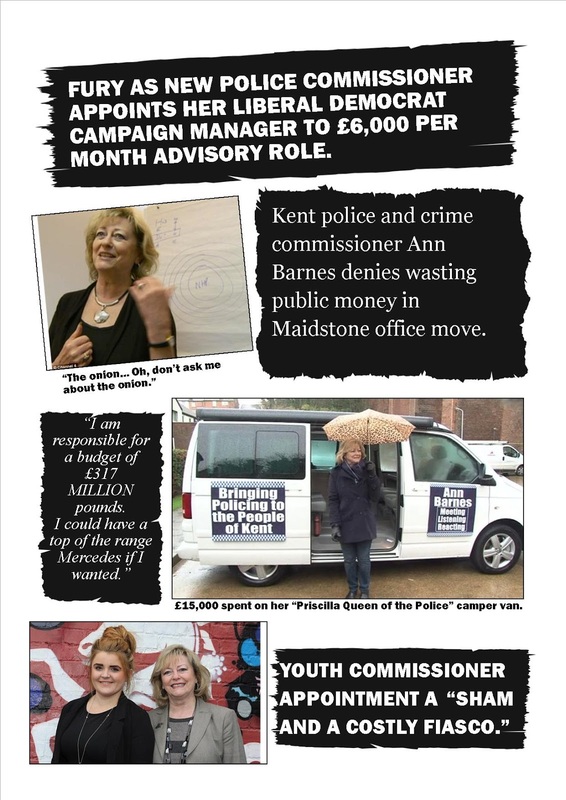 Kent Police and Crime Commissioner. They're not laughing now! In 2012 Kent Conservatives, in an open a democratic process, selected Craig Mackinlay as their candidate for Police and Crime Commissioner. "I would like to thank Conservative Party members for this honour. If elected I will bring a simplicity, transparency and honesty to the role. I will work to bring policing back to the community. I will work alongside the Chief Constable to ensure we no longer ignore people who report crime in order to reduce the crime statistics. And most importantly of all, I will work with communities which are blighted by crime and anti-social behaviour. Why do I want this job? Because I am from an area of North Kent which has too often been affected by crime. I live in Chatham Town Centre and see at first hand just how such behaviour affects people's lives, and as a magistrate on the North Kent Bench I see the cost of crime, both on individuals and communities. I also represent a ward in central Chatham which has one of the highest crime rates in Kent, including drug abuse and prostitution. I believe in zero tolerance policing, but that is not enough. We need to work with local councils, agencies, health providers and support agencies to ensure once people are taken away from crime, they have the training, support and rehabilitation they need to become active and valued members of society again. Just as we have achieved on the streets of Chatham. Basically I am on the side of the silent majority. The silent majority who work hard, respect the rules and pay their fair share." How the Kent "establishment" laughed. 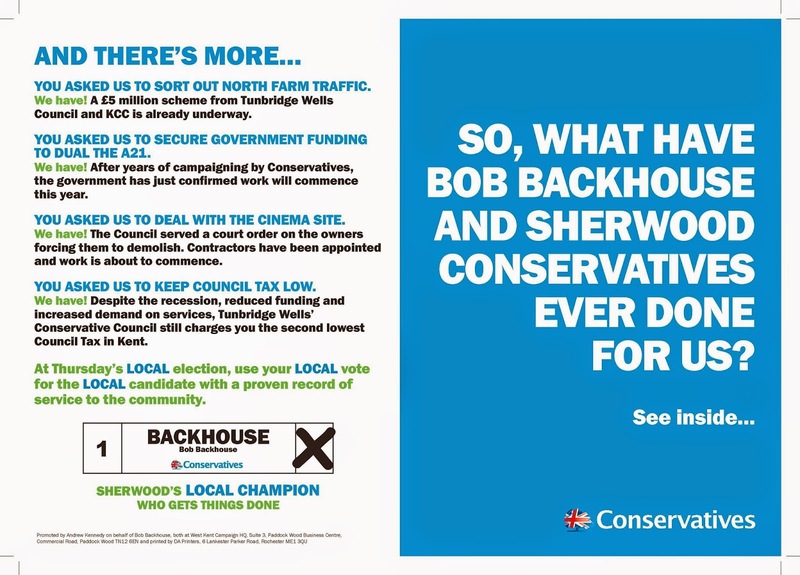 How could the Conservative Party have selected someone with such simple messages, and someone from Chatham to boot. Instead they backed Mrs Barnes. Excitement at West Kent Towers. On Friday, after we have packed and posted the summer draw tickets, we are heading to Eastbourne, to confirm arrangements for our 40:40 Campaign Day on Saturday 7 June. Apparently we are meeting the British Queen ! No, not this one... Apparently there are two. Prior to the elections, the Returning Officer for Tower Hamlet put in place a local protocol which represented a commitment by all parties, individuals and organisations involved in the May 2014 elections in Tower Hamlets to work towards free and fair elections. The Electoral Commission and the Metropolitan Police supported this protocol. As part of this protocol, a dedicated email address was set up to allow campaigners and parties to report any incidences of electoral irregularities. The full protocol is available here. 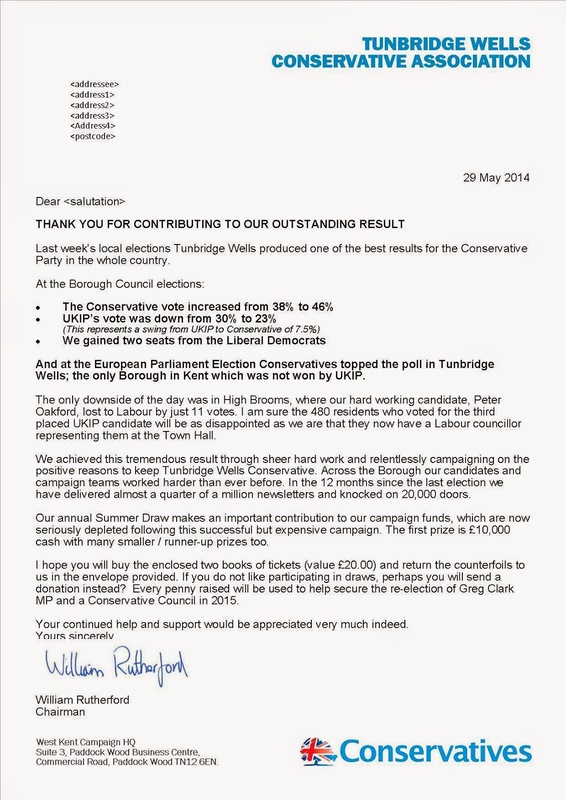 It's a sad state of affairs, when in a London borough in 2014 we are "working towards free and fair elections..."
From the Tunbridge Wells Borough Council website! Re-motivating myself (and the team) can also be difficult. The sense of urgency and immediacy, which has dominated our work for months, drains away. As dedicated as we are, completing 38 sets of election expenses is not as much fun as putting together a last minute leaflet or working towards a looming print deadline. The job gets done of course - but it needs a lot of discipline not to put it off "just until tomorrow". 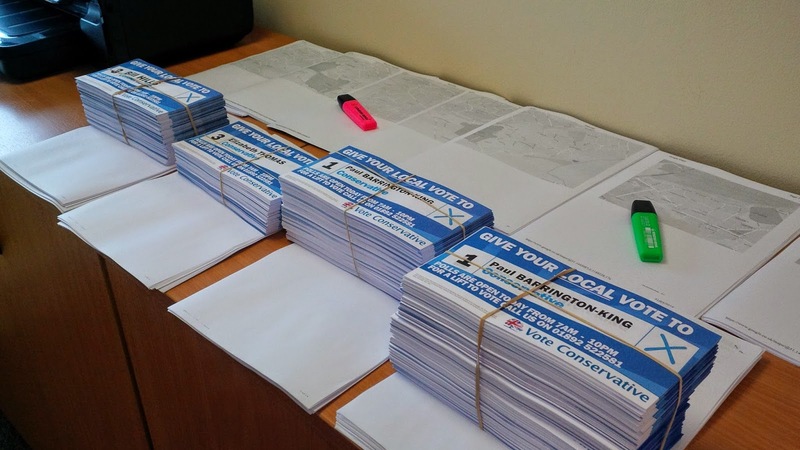 I deal with this hiatus by having a plan in place to enable us to "hit the ground running" - so this week, having dealt with the Summer Raffle (five constituencies worth) and sending to print 30,000 "thank you for voting Conservative" leaflets, we will be launching our Summer Campaign. This will be a mailshot to approximately 10,000 targets in each of our five Associations (so 50,000 in total) aimed at recruiting new delivery helpers, poster sites and clerical helpers to supplement our teams as we prepare for 2015. 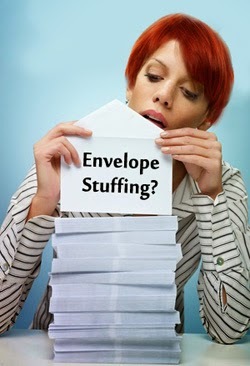 As always, I will publish samples of what we do on this blog. And, of course, with all out elections (in Tonbridge & Malling and Medway) co-terminus with the GE (and thirds in Maidstone and TW - as well as three political town councils) we will also need to manage the selection, recruitment and training of (wait for it) 185 local government candidates. 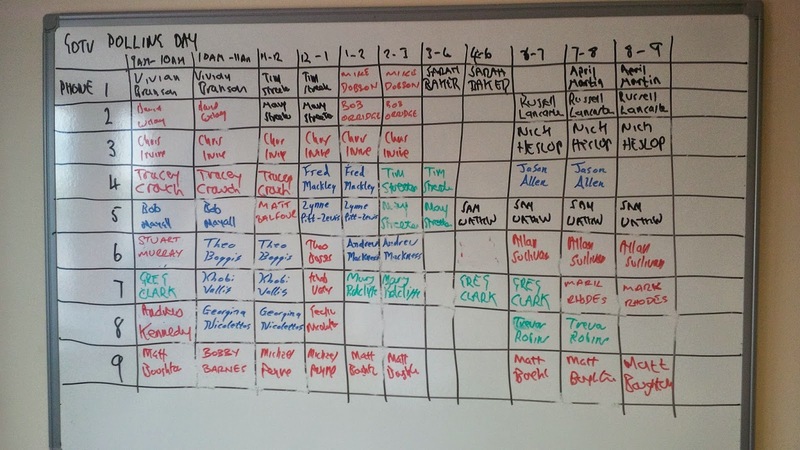 And we also have our Eastbourne 40:40 Campaign Day a week on Saturday. Still places available if you'd like to join our charabanc to the seaside! See HERE! 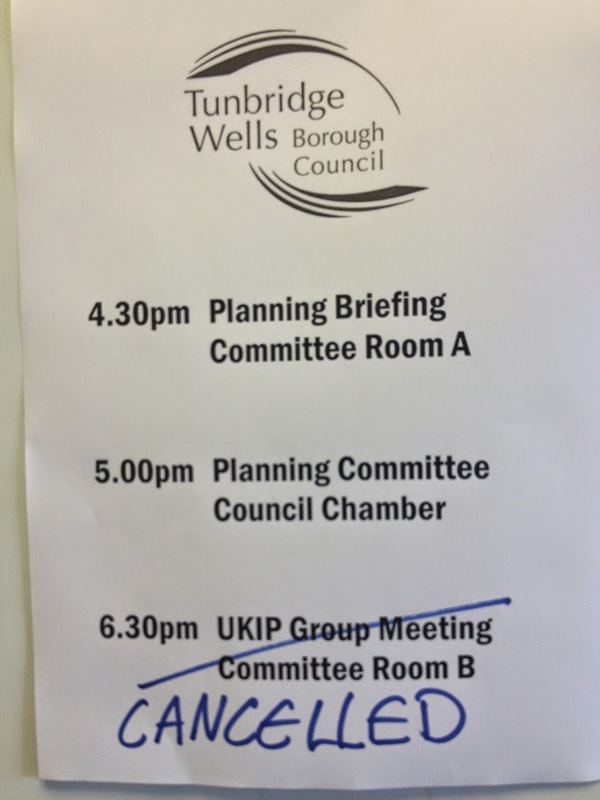 It's no secret that last year (for the County Council elections) UKIP ran us close in Tunbridge Wells. They had the "big mo" and were confident of victory. 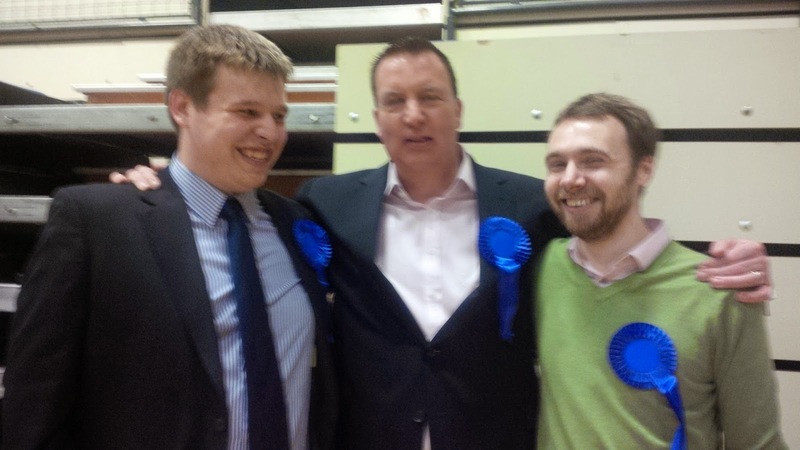 The media thought likewise; Michael Crick was at the count with a camera crew to record for posterity the night True Blue Tunbridge Wells was lost by the Conservative Party. He left disappointed. The result however was a wake-up call for us all. 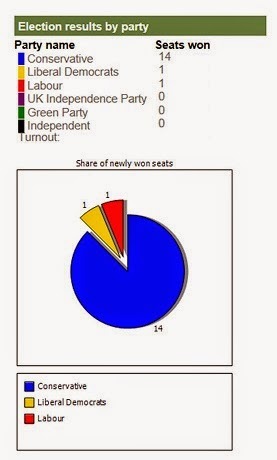 Even in Tunbridge Wells we could no longer deliver one or two glossy leaflets and wait for the majorities to pile-up.I recall to this day the feeling of dread as I saw the ballot boxes being emptied and UKIP running us close, even in what were once rock solid Tory villages. Had it not been for the amazing work we had done recruiting postal voters and driving turnout, things might have been very different indeed. We knew that with the 2014 Borough election co-terminus with the EU poll, Europe would be higher on the agenda than 2013. 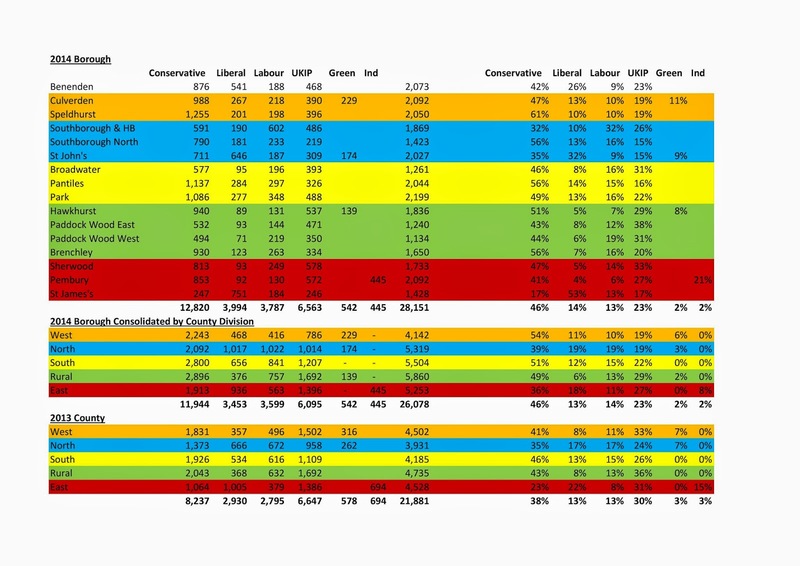 It would only take a small additional swing to UKIP to deliver a significant swathe of Borough seats. UKIP knew this too. In the wake of 2013 election, I organised a seminar for all branch chairmen, activists and councillors. I was brutally honest in my assessment. "Had these been borough not county council elections, we would have probably lost 7 borough council seats." Interestingly, these were (more or less) the same seven seats that UKIP bloggers were predicting they would gain on Twitter a few days ago. We put in place a demanding schedule of doorstep campaigning across the constituency, commencing in June last year. We didn't just visit the marginals - we went into every ward and village to demonstrate we were taking no voter for granted. Greg Clark MP was truly outstanding in supporting this activity - he was out there every single time. We selected our candidates in summer, allowing 9 months of campaigning and profile building. We implemented in full the CCHQ mandatory selection rules, every candidate (even long serving incumbents) were re-interviewed and had to re-apply for their seats. None were deselected, but it imposed a discipline. By making candidates outline their campaign plans and community involvement it focused minds on the forthcoming campaign. Even sceptical (and at times hostile) councillors concluded the process was fair and even helpful in terms of defining their work and the campaign ahead. 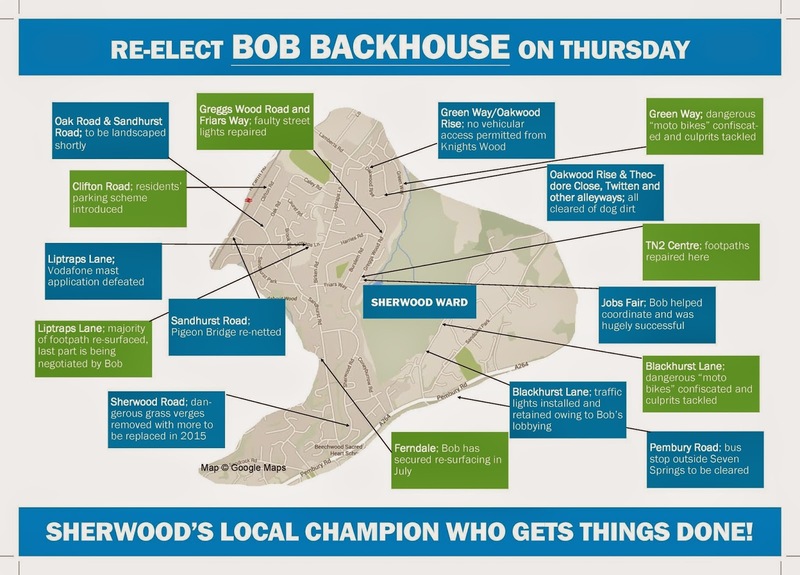 We produced a series of borough-wide newsletters, the back page containing generic copy and the front pages ward-specific, to promote our candidates and give them ownership. Candidates were banned from talking about committees and local government bureaucracy; every story had to be about what they had achieved for the people they represent. We made a principled decision not to attack our opponents (or allow others to do so by proxy). Throughout the campaign we remained positive and respectful. 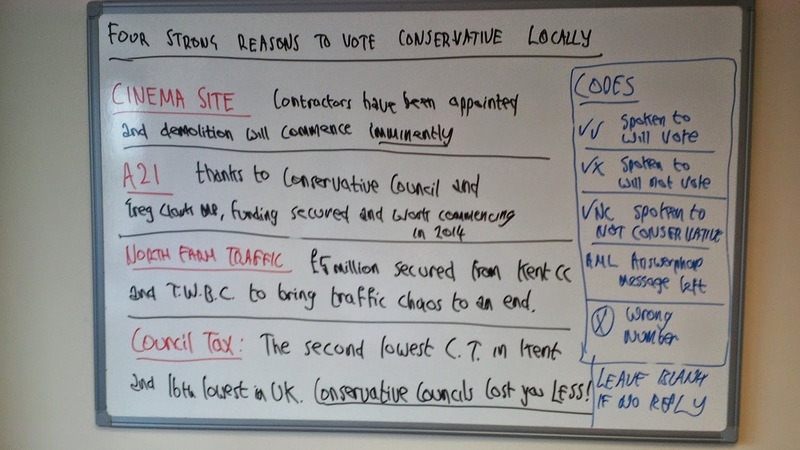 We fixed our four campaign themes early - four positive messages about what the Conservatives had or would achieve and we stuck to them rigidly throughout. Every candidate bought into the plan; we had absolute campaign discipline. No-one went off message or even tried to do so. Even long standing councillors who were sceptical about what I was asking them to do accepted (sometimes with reluctance) the need for one more leaflet. There were no prima donnas demanding their own leaflets, or a different shade of blue on the posters. 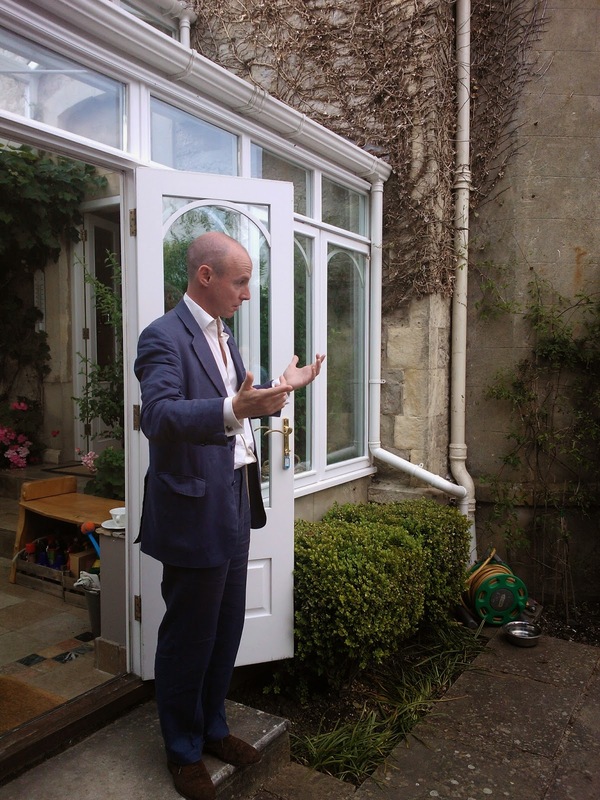 By polling day we had delivered almost quarter of a million newsletters and had spoken to (or the doorstep or telephone) over 20,000 residents. In our target seats every Conservative pledge would have received at least ten points of contact with the Conservative Party since the last election (four points of contact in the week before poll). This included a hand written pledge letter to approximately 20,000 voters on the eve of poll. Well done to a magnificent team. They fought like tigers and deserved to win. Bloody wonderful! One of our hardest working candidates, Nasir Jamil, has gained St John's ward from the LibDems. He is one of those candidates who, once selected, works tirelessly and without complaint, tramping the streets night after night. He has knocked on every door in the ward twice and delivered six leaflets since Christmas. This is his third attempt, and I am so pleased for him. 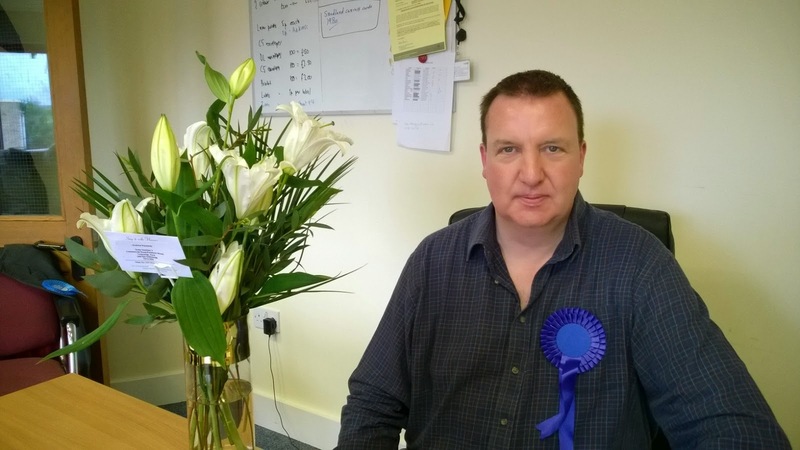 It was tight all the way, and I would like to pay tribute to the outgoing LibDem Trevor Poile, who worked really hard and was absolutely magnanimous when the result came through - best wishes Trevor. Nasir was not able to attend the count as he was at work, so I captured the declaration on my phone. Listen to the howels at the end when our RO, having announced the correct figures, then declared the wrong candidate "elected" ! 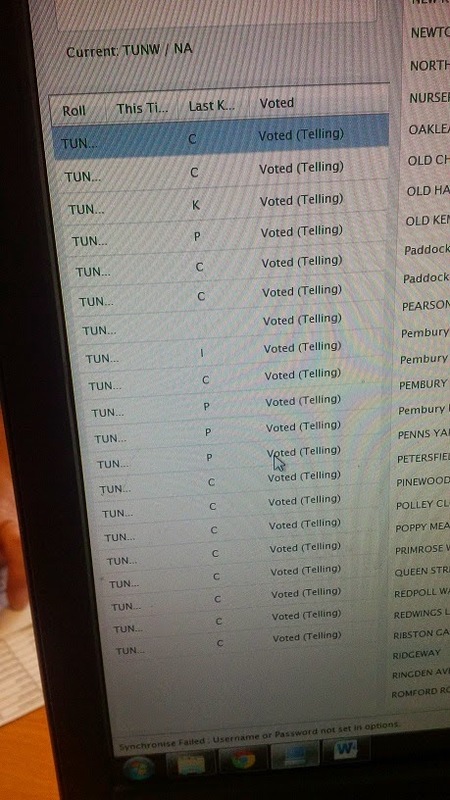 @UkipTWells 2/3. Probables... cont: Steve Lucasc, Sherwood; @FordForrester, St Johns; @JohnCaveAusten, Hawkhurst.. so minimum of 7. I am loathed to say it, but I think we might better than I feared. In fact, the ballot box samples look a bit too good to be true - after last night's bruising I am disinclined to believe my own figures and judgement. Also, with so many pledges with PVs it is increasingly difficult to sample accurately. Everyone is being kind and friendly; wishing my happy birthday and thanking me for what I have done for them. Banter with Dave Neve and Ben Chapelard (LibDem councillors, I actually like them - much to the disapproval of some colleagues). 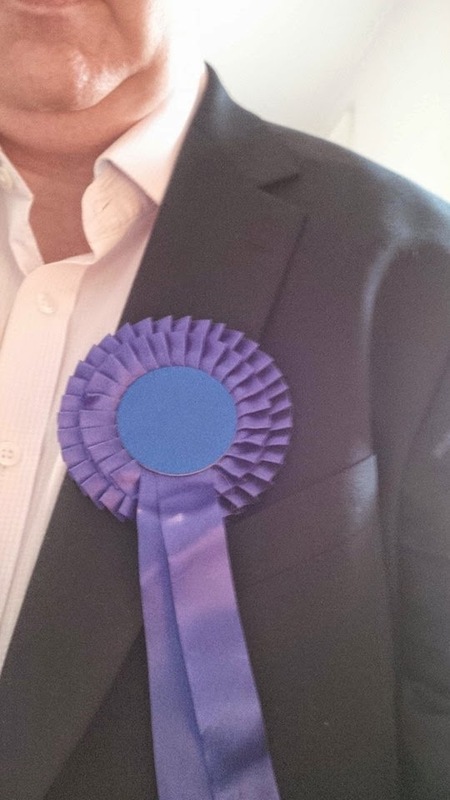 I have selected my most traditional dark blue Conservative rosette to see me through the day (I have an superstition; like an MP rubbing Sir Winston's foot or a footballer having lucky boots) I always destroy a rosette if we have a bad result whilst I am wearing it. As a consequence, last night's is toast! Instead I have selected the one I wore in 2011 for the local elections and No to AV campaign. Off to the count. I feel nervous, but as proud of my Party as I was 35 years ago when I first joined in 1979! Decided to treat myself to a cooked English breakfast in the hotel restaurant. Pleased to be joined by the TW Chairman, William Rutherford, at 8.30am. William has kindly brought me a bottle of Champagne to celebrate my birthday. We chat about the day, how we might refocus the Association after what we both fear will be a difficult result. The members have put their heart and sole into this campaign, seeing their brave faces trying to hide their exhaustion and bitter disappointment is perhaps the hardest thing. I am fortunate to have such a great Chairman; William and I have faced a few battles together, and I trust him absolutely. There is a lot of gallows humour. Arrived back at my hotel in Tunbridge Wells, located directly opposite the count, which commences in three hours. My bed is untouched - if I fall asleep I fear I might not wake up in time. I feel dreadful, mentally and physically exhausted, and have a deep sense of foreboding about what we are about to face. The results are in, and I was right. Five losses. They've started counting the votes. For some bizarre reason, one counter is counting them face down... "you're supposed to count them face up..." Each time she puts down a ballot paper she obviously cannot see it, so puts it into the wrong pile. Then picks them all up again to see which pile is which and starts again. It's like Chinese water torture. 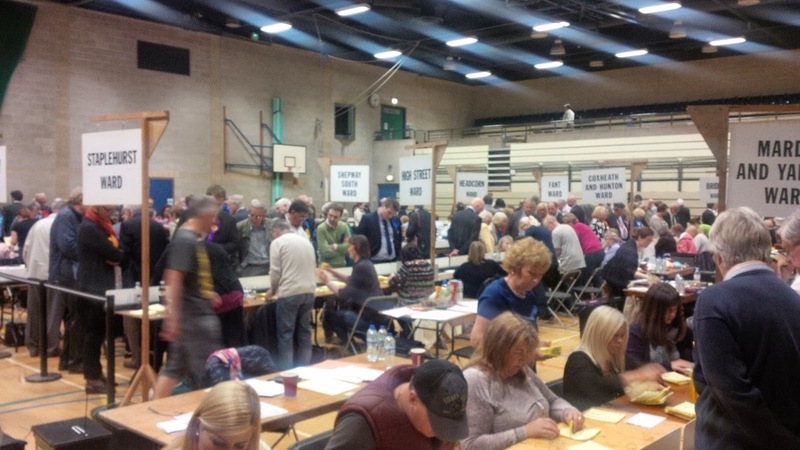 And why do LibDems bring carrier bags and trolleys to the count ? It resembles the misdirected luggage desk at Mumbia airport. By the way, not liking the look of what I am seeing. Just sent the South Zone Oberleutnant a text, "It's grim - we're going to lose Maidstone to NOC. Five / six losses. 1am came and went. Apparently they cannot commence stage 2 until, "Southampton" sign-off the EU count verification. "Everyone is working as hard as they can". Nearly 2am and not a single vote has been counted. At least in Ukraine they know the results quickly. The West Kent Massive prepares for a long night ahead. It's gone midnight and they are still bringing in ballot boxes from rural polling stations. They "hope" to commence stage 2 of the count "at about 2pm". Arrrggghhh. Over 4300 calls made and we're still going strong. Here is the final late evening team. Where the hell are Jon Botten and Matt Boughton when I need them ! And here comes the early evening shift. 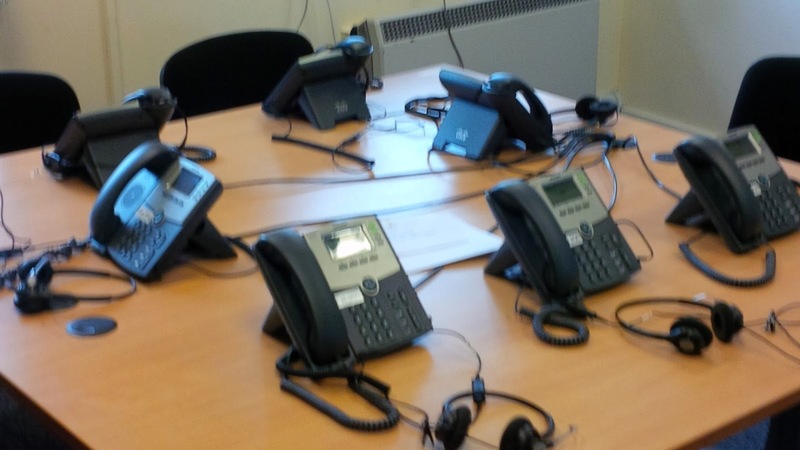 3700 calls made so far! The afternoon shift change brings new volunteers, waiving with enthusiasm! 2600 calls made so far. We originally hoped to make 3000, our new target is 4500. Well, the Cs are voting in droves. Let's just hope they're still voting the right way! Here is a video of the team in action ! By noon we had made 1,800 GOTV calls - 500 ahead of schedule. One of the advantages of having the town's best baker as a candidate, there's never a shortage of food for the troops. 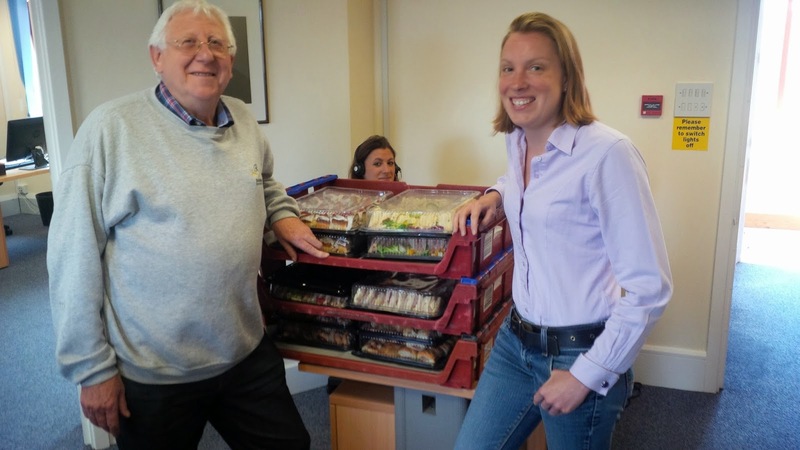 Tracey Crouch, who spends her life either hungry or looking for the lavatory, was the first to arrive! 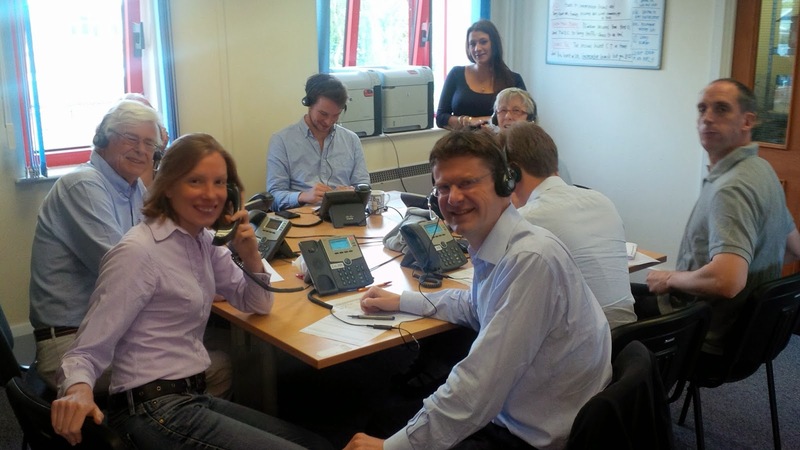 Greg Clark MP and Tracey Crouch MP lead the first team staffing the phones for GOTV. Also in picture Bobby Barnes, Theo Boggis, Khobi Vallis, Vivian Branson, Bob Mayall and Matthew Dickens. Another team working in the room next door! Opened Campaign HQ and - best part of the day..... the sticky buns have arrived! I remember going to a by-election in North Yorkshire in the 1980s. I was sent to a very remote farming village to help run the "Committee Room" only to find the entire committee in the Village Hall setting-up their "election day lunch". Having identified myself, I was given the important task of polishing the wine glasses. By 12.30pm the entire village seemed to be there, perhaps 200+ people. We ate roast beef, drank Claret then whisky and Cognac and sang patriotic songs until 5pm. When I suggested "shouldn't we do some knocking-up" I was told, "no point laddie - we're all in 'ere". After we had all mucked-in with the washing-up, they all climbed into the land rovers and went to vote. At the end of the day the Committee Chairman looked down his voters list and said, "there you go laddie, 85% 'ave voted, and apart from the commie b*stard who makes pots, they've all voted right way." Out delivering GOTV leaflets on my way to the office. After all these years I should know that for 99.5% of the population, elections are just something that happen once a year. But for me (and almost everyone around me) they are life consuming events which fill our every waking hour! I always feel a sense of anti-climax on election day when I realise just how unimportant it all is for the majority of people. Nothing brings this home more strongly than seeing piles of unread election leaflets in the recycling bins! We're just back from delivering eve of poll pledge letters and are setting-up HQ ready for tomorrow. 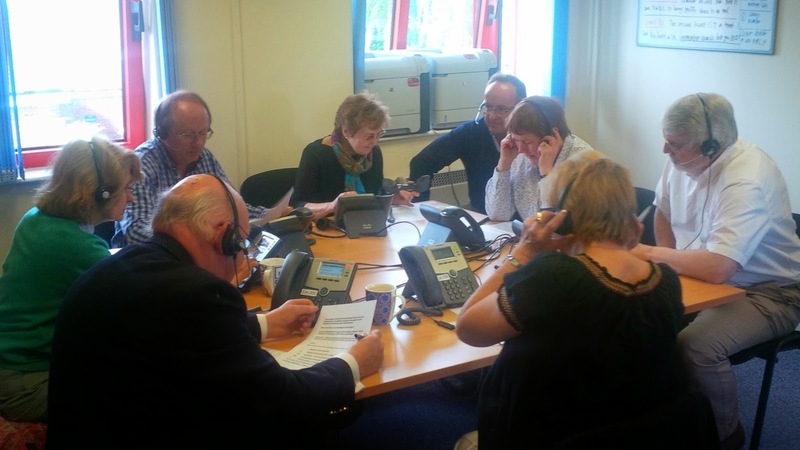 Jon and I are running 7 wards between us; with 12 additional "stand alone" Campaign HQ throughout the West Kent Area. 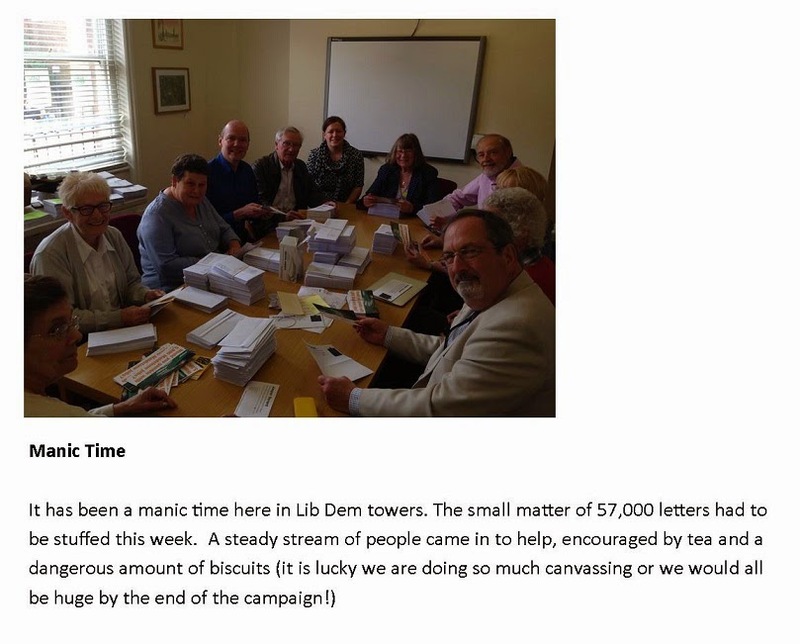 I cannot speak for Maidstone as they only joined the West Kent Group three months ago, but over the last 12 months our wonderful team of activists in Tunbridge Wells have delivered approaching a quarter of a million newsletters. 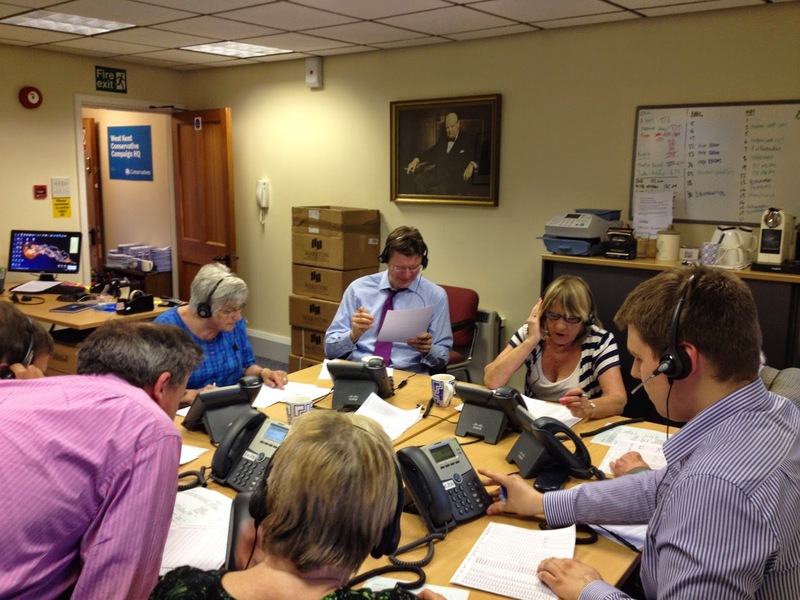 Greg Clark MP has been outstanding throughout, working almost every Saturday with the teams on the doorsteps. Activists from Tonbridge & Malling and Chatham & Aylesford have also been magnificent in providing mutual aid - as have friends from outside the West Kent area (particularly Rochester & Strood). It's been a wonderful team effort. Thank you all. Finally, a note of thanks to the South Zone Oberleutnant who really cheered me up earlier with an email (in reply to mine expressing concern about what we might do next week) which said... "there's always the summer raffle". Indeed there is! I am grateful to a reader for sending me this email, received this morning, from Shadow Chancellor, Ed Balls. Still, I suppose it's an improvement on Post-Neoclassical Endogenous Growth Theory. It is a great honour that Rt Hon Nicholas Soames MP has accepted an invitation to speak at an Afternoon Tea, co-hosted by Tracey Crouch MP and Tom Tugendhat, which will form part of our World War One commemorations. The event will be an Afternoon Tea at the Royal British Legion Village in Aylesford on Friday 27 June 2014. 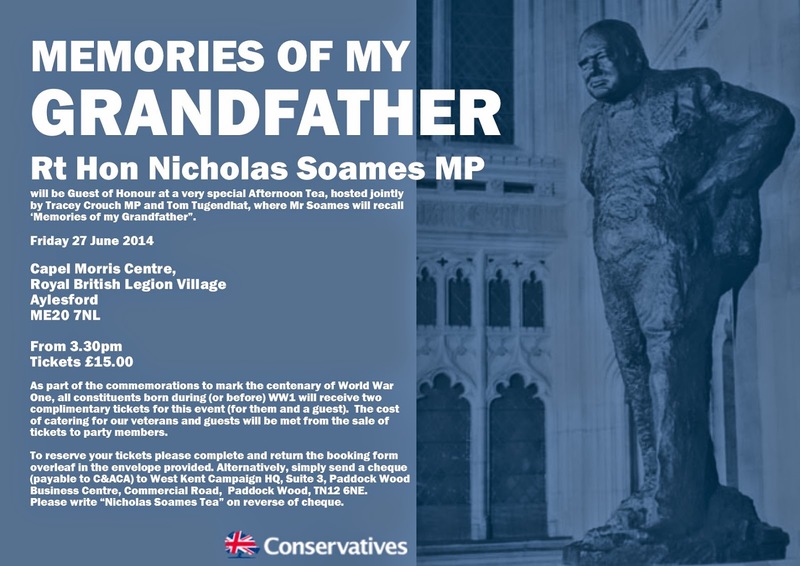 Mr Soames will speak about "Memories of my Grandfather". Tickets for the tea will be £15.00 for members, but we are also inviting (free of charge) all residents, in both constituencies, who were born during or before WWI (of which there are over 250). If any readers would like to attend, please send a cheque (for £15.00 pp) payable to C&ACA, to West Kent Conservative Campaign HQ, Suite 3, Paddock Wood Buusiness Centre, Commercial Road, Paddock Wood TN12 6EN. I leave them in charge for one night ! "It's comedy gold at West Kent Towers. Peter Bolt (T&M councillor) has tied his Waitrose shopping to his belt with string so he doesn't forget to take his bags with him. Every time he goes to the loo he drags them behind. Chris Woodward keeps forgetting to take his headset off when he stands up, and keeps pull the phones off the table. And (name) phoned to say she couldn't come as she has misplaced her false teeth." And here's tonight's team. Great to see Greg Clark MP lead from the front! GOTV! Still a few slots left! Amazing response from members of Tonbridge & Malling and Chatham & Aylesford, sending troops into Tunbridge Wells and Maidstone to help GET OUT THE VOTE. We still have a few afternoon and early evening slots to fill. Come and join us! Email me at westkentconservatives@gmail.com to offer your services! Each year I send a letter of thanks and good luck to all our candidates and their campaign teams. Here is this year's to our Tunbridge Wells candidates and activists. 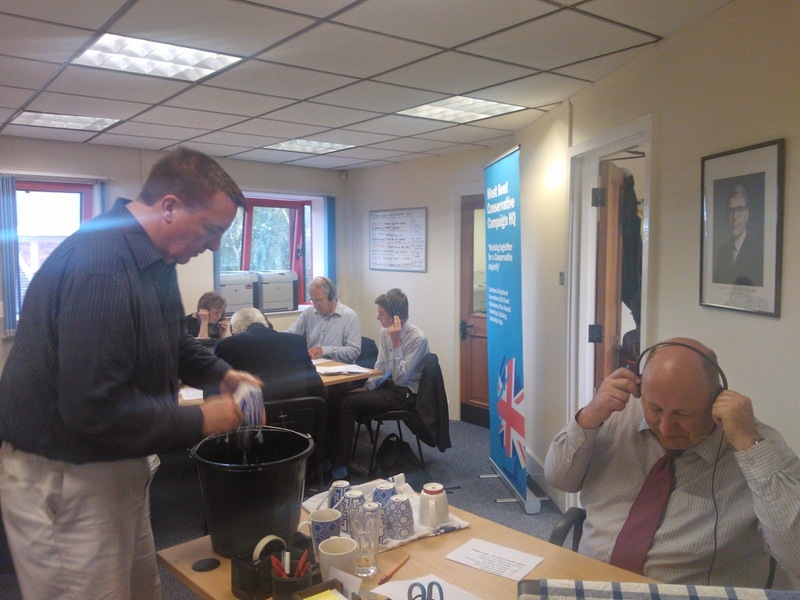 Full steam ahead on the phones tonight! 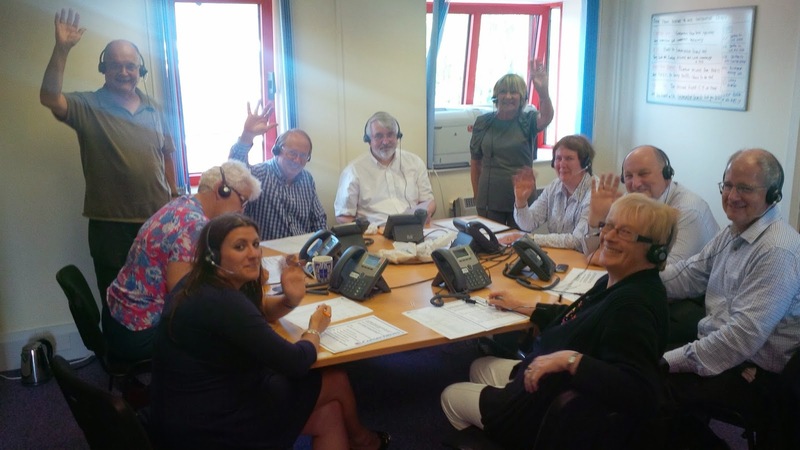 The West Kent Towers Phone Bank was at full steam tonight - all ten lines in use; with two additional people on their mobiles. Once again, volunteers from Tonbridge & Malling have been absolutely outstanding with their mutual aid. Tonight's team was led by T&Ms Parliamentary Candidate, Tom Tugendhat and T&M Chairman, Jacques Arnold. Also present were Russell Lancaster, Vivian Branson, Michael Payne, Jon Botten, Matt Boughton and Culverden candidate Don Sloan. Here is our weekend "What Have the Conservatives Ever Done for Us?" leaflet. Obviously different versions for each ward. A Stella performance from Kent's Polie & Crime Commissioner, who never fails to live down to my expectations. If she's still paying her Lib Dem Campaign Manager £9,000 per month of our money as her image advisor, I hope she asks for a refund. Cheer up, the clock is ticking. Only two years left. I've done it! 4 stone off with two weeks spare! Well, I've done it! At my weekly weigh-in this afternoon I had lost another 3lb since last week, bringing my total weight loss since 1 January to four stone. I've hit my target with two weeks to spare. My journey isn't over - though stage one of it is. 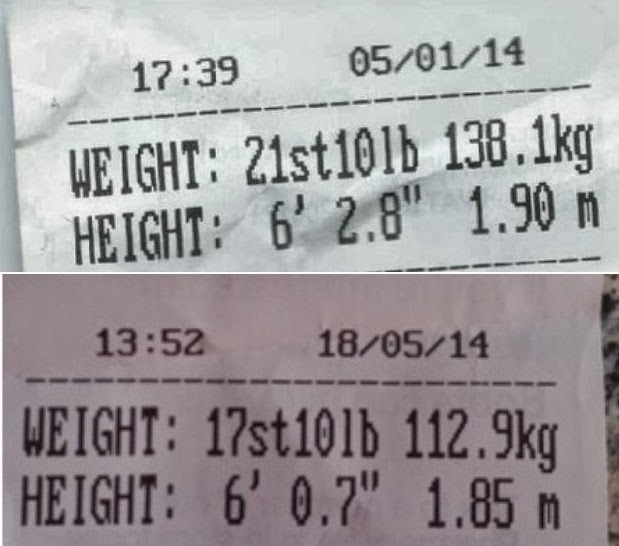 I am still 17 stone 10lb, which is still overweight. My intention is to lose a futher 2 stone over the summer months, but at a slower pace than I have been losing since New Year. I am really grateful to my friends and colleagues who have been so kind and supportive. Your good wishes really encouraged me to achieve my goal. Up at the crack of dawn and on the road by 7.30am. Like almost every Conservative activist in the UK, I think I am now functioning purely on black coffee and adrenaline! 9.30am: First stop Paddock Wood to meet-up with Greg Clark MP, Tom Tugendhat and an amazing team of supporters who'd come to help from Tonbridge & Malling. 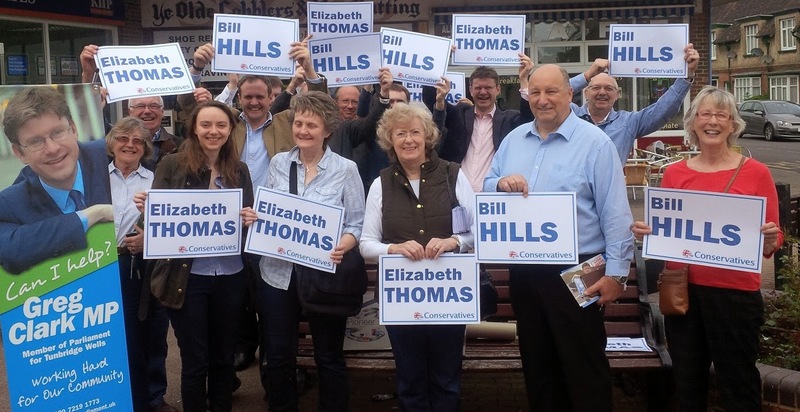 3,500 leaflets delivered in two hours in support of our local candidates, Elizabeth Thomas and Bill Hills. 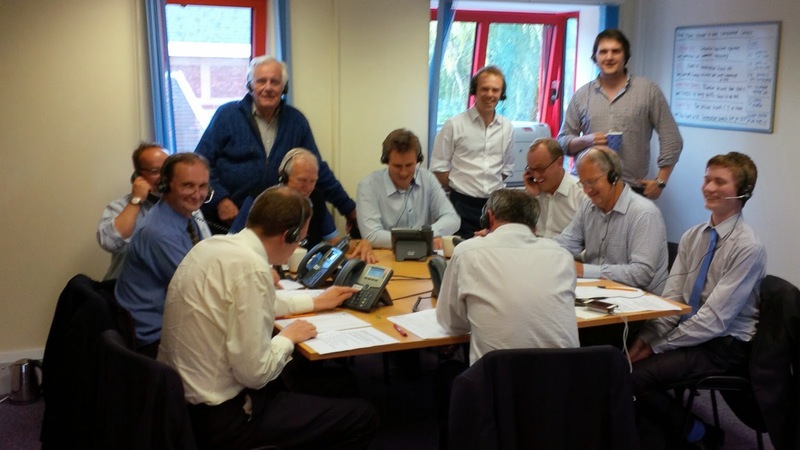 From left: Anne-Marie Nelson, Stuart Murray, Sophie Shrubsole, Tom Tugendhat, Matt Boughton, Chris Baldock, Howard Rogers, Jon Botten, Elizabeth Thomas, Greg Clark MP, Bill Hills, Owen Baldock and Vivian Branson . Out of sight: Jacques Arnold and Richard Jeffryes. 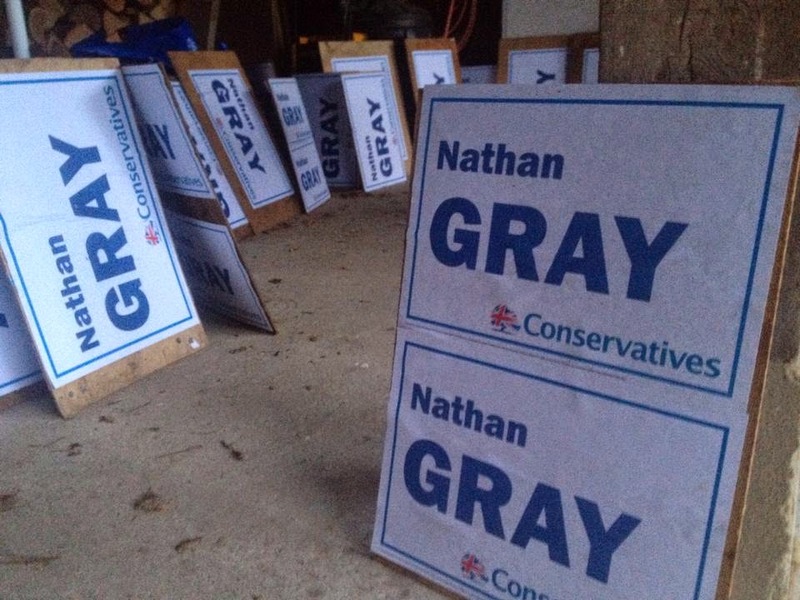 Meanwhile, in the rural Hawkhurst & Sandhurst ward, our excellent candidate Nathan Gray and his team swamp the main roads with his poster dispay. 3.30pm: Next stop was the Rose & Crown in Tonbridge, where we had invited Conservative to UKIP switchers to come along and hear Dan speak. About 30 people came, and were impressed with Dan's clear position on the referendum and his positive message about voting Conservative on Thursday. 4.45pm: Final campaign stop of the day was Tunbridge Wells, where Dan was guest speaker at a special event in the home of Paul and Tracy Moore (local supporters) to mark the re-launch of the local Conservative Party branch in Park ward. 6.30pm: Dropped Dan off in TW town centre, where he was collected by Dee Morris to take him onto Swanley to address their annual dinner. 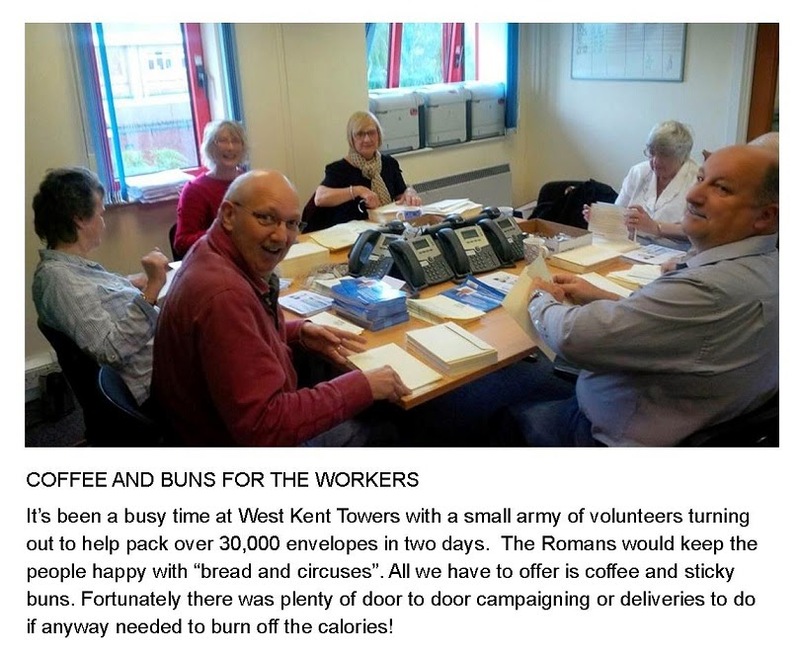 During the day several candidates have emailed to ask for additional leaflets or more SYWO cards so back to West Kent Towers to kick start the risograph! 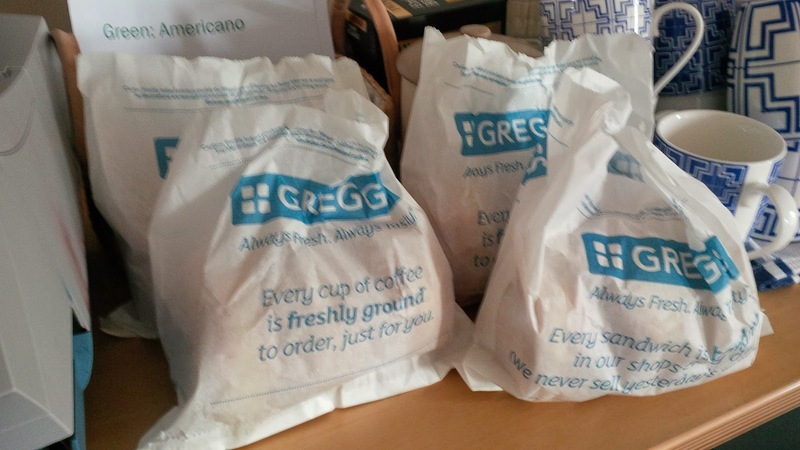 ﻿10.00pm: Home, with a bag full of Indian takeaway. 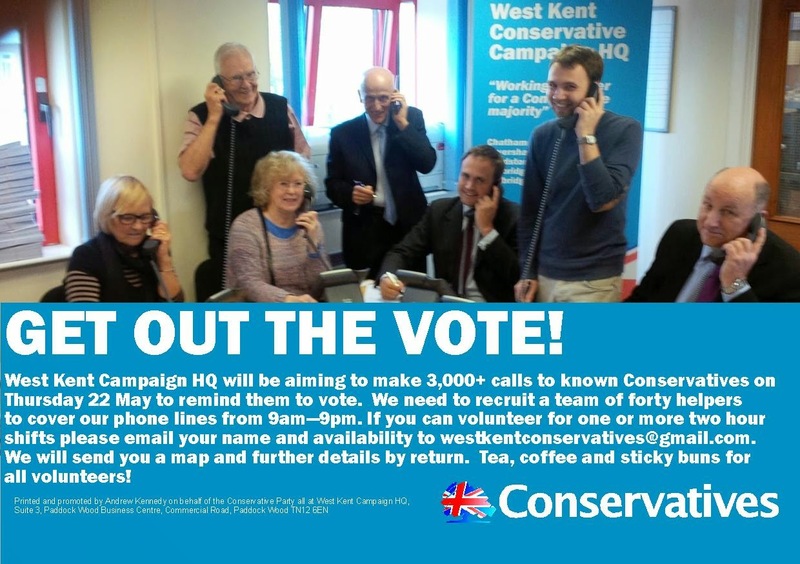 Matt Boughton: "West Kent Conservative Campaign Headquarters, how can I help..."
My name is Councillor Fred Barchester (not real name) and I am telephoning to say that I am appalled, I shall repeat that, APPALLED, that the agent had not responded to my very urgent email sent yesterday, nor the two reminders I sent earlier today. Matt Boughton: "I am sorry, which email address did you send it to? I am sure if he had received it he would have replied..."
I sent it to westkentconservatives@gmail.org In total I have sent about five emails, and none have received a reply. I am not too happy about this new office arrangement - totally inefficient. Matt Boughton: "That's the problem Mr Barchester, you have sent it to the wrong email address. It's .com not .org - that would explain it." Well, he still hasn't replied. Matt Boughton: "Probably because he didn't receive it." Your just making excuses for his inefficiency. Click. Scheduled to be in Westminster for an evening meeting, I decided to travel up early for a change of scene. 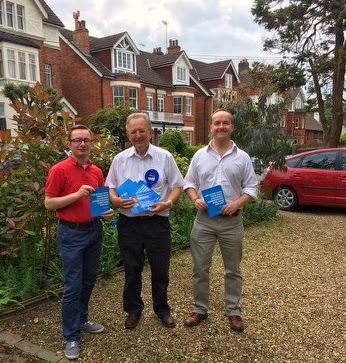 So today, rather than campaign on the doorsteps of Kent I was campaigning on the doorsteps of Battersea, in support of my friend, Matthew Plummer. 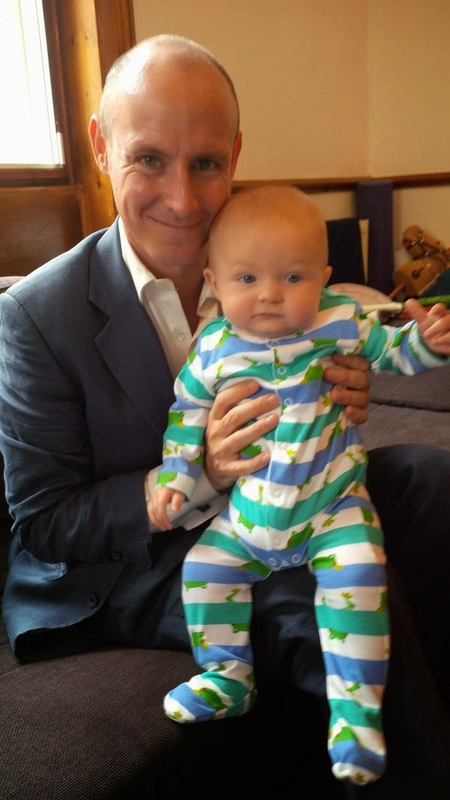 Matthew is fighting Labour's most marginal seat in the Tory Flagship of Wandsworth - the Brighter Borough! "I've produced a schedule to show you all the sights of Latchemere", he announced, pulling from his panniers a wodge of dog eared canvassing sheets, the thickness of which made my blood run cold. "Off we go..."
We started in "Little India", rows of million pound terraced houses in the shadow of Clapham Junction. If any evidence were needed of the type of people we were visiting, it came from a yummy mummy who opened her door to shout after her daughter, "Anustavia, can you buy Henriette a Kinder Egg too..."
After an hour of relative true blue luxury we walked through a park to 1905 social housing estate which is now predominantly owner occupied. There we met another member of the team; a well preserved lady who was a councillor from the ward next door. "I'm from the ward next door" she announced, with a hint of demonic self-confidence which made me flinch. Off we set in pursuit of the undecided. "Hi, I'm Matthew Plummer, hi Matthew Plummer ...Matthew Plummer" repeated Matthew Plummer, glad handing his way down each road. At the neighbouring door I overheard the lady councillor's patter, "Are you new or are you blue" she shrieked at startled occupants, indicating that only someone who has just moved-in could possible not vote Conservative in Wandsworth. "Matthew Plummer, Matthew Plummer" chirruped the candidate. My own low key canvassing style seemed quite inadequate by comparison. Suddenly Matthew Plummer was off down the road; he had spotted two blokes sitting in a parked car and had a sudden urge to tell them that his name was "Matthew Plummer". Whilst he was gone, Mrs Are You New or Are You Blue decided I needed reinforcements, so appeared beside me on a doorstep, where I was having a nice chat with a lady who had just moved in. "I'm from next door" she announced, to the increasingly suspicious occupant who was now confronted with a slighly deranged looking woman claiming to be her neighbour. Then "Matthew Plummer, Matthew Plummer" appeared as well. "Is there anything we can help you with ? Parking bays, uncut verges, school appeals" he said, sounding like a voiceover for a daytime TV payday loans advert. . "Are you blue", said the women from next door, before adding a new line to her repertoire, "I always say if it is not broken it does not need fixing." At the end of the road 'Matthew Plummer, Matthew Plummer' announced that his sister was about to arrive. Apparently she had flown back from New Zealand to help with canvassing. Compared with the rest of us she looked quite normal, before she said, "I think I might be having a hypo-glycemic fit". I am pleased to say she didn't, though she did look a bit shaky. Then another of the candidates arrived who promptly announced that her church had prayed for her that morning. "Why, what have you done?" I asked. "I haven't done anything" she said, "they're praying for a Conservative victory." "Right" said Matthew Plummer, with a glint in his eye. "I'm going to take you up a tower block." Coming from leafy West Kent where some of our wards have more castles than council houses, the 15 story concrete tower made me gird my loins. The block, however, was clean, the lift worked and even if the occupants weren't that politically engaged, there was no hostility, and from many even a grudging respect for the Council. Towards the end, just as I was starting to flag, a man opened his door. I introduced myself and handed over the calling card. "You can count of me all the way" he said, without a moments hesitation. "Thank you", I said. "Back in 1982 that Maggie Thatcher allowed my Mam and Dad to buy their council house, first time in their lives they ever owned a home of their own. Never looked back and we have voted for you lot ever since." Here I was, in the depths of Conservative Wandsworth, where the streets are clean, the verges are neat, the lifts work, and the parks are well maintained. They have the lowest Council Tax in the country, 50% cheaper than anywhere else. And I was standing in front of a man who remembered what we had done for his family 30 years ago, and had voted for us ever since. At that moment, I remembered why I was a Conservative and politics seemed worthwhile endeavor again. Good luck to Matthew Plummer and all my friends fighting to keep Wandsworth Council Conservative. The say that imitation is the sincerest form of flattery - but really! If any readers have a few hours to spare on polling day and would like to see our new Campaign HQ (and help two Borough Council elections at the same time as the EU campaign) please come and join us. Free tea, coffee and sticky buns for all helpers! Almost there! 2 lb to go. The Election Fairy strikes again! Thank you, Mr Browning ! 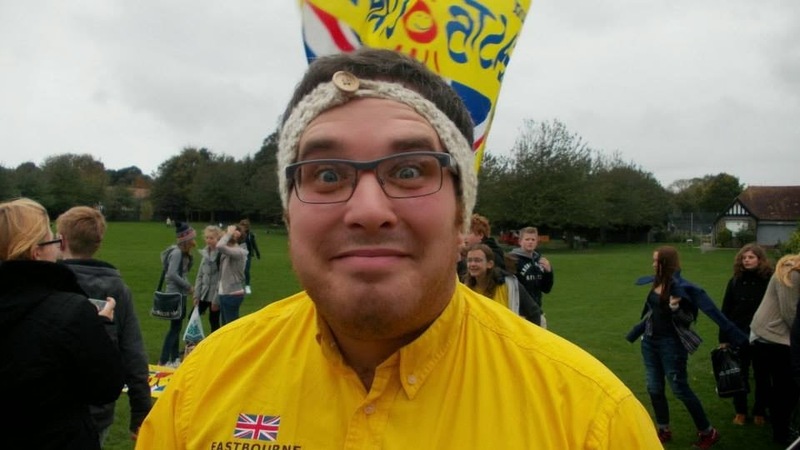 Weight loss - one last push to raise £3,000! That's a long one ! The glamour of a builder's bucket for a sink!